Every New Haven skier must, at some point, come to terms with a simple fact: Connecticut is not a great place to ski. 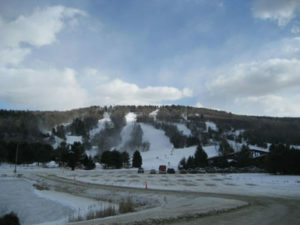 In fact, out of all New England states, Connecticut has the fewest ski resorts and the smallest vertical. Put simply, there aren’t very many places to ski, and if you do find a mountain, it is likely very small. This dearth of opportunities is part of the reason for the New Haven Ski Club’s existence; we wanted to provide a platform for people to share information and organize group trips. Like most Connecticut skiers and snowboarders, we travel to New Hampshire, Massachusetts, Vermont, and Maine for additional ski opportunities. These states and resorts are close enough for a weekend trip. They also offer some of the best terrain in the country—everything from backcountry skiing and glades to rolling greens and blues. Travelling a bit can have a huge payoff for serious New Haven skiers. Plus, by traveling with us, i.e. carpooling, you work to minimize your energy output. If enough people join a trip, we may even be eligible for the elusive group discounted lift tickets offered at ski resorts across New England. Though advertised, these discounts are often only available for groups of 15-20+ adults, and they must be booked far in advance. However, with enough support and organization, the New Haven Ski Club can muster enough interest and availability to save big—sometimes up to 25%. This is a wonderful way to meet fellow skiers, save some money, and impact the environment in a positive way. If you can’t make it to one of our trips and don’t want to drive, consider taking a bus, Megabus, or Train to the Granite State. Trains, though more expensive, can get you to the northern parts of New England significantly faster than a bus or car; you won’t sit in weekend ski traffic, and you can use the time to plan your trip. Busses, in contrast, are subject to traffic delays and uncomfortable seating, but will only run you around $25 per trip (depending on date, time, and availability). In any case, heading north in a group—be it with the New Haven Ski Club, on a Megabus, or on the Amtrak—is more sustainable than driving yourself. Considering your options can save time, money, and the environment.